Klompching Gallery is delighted to present Commorancy, a group exhibition of contemporary photographs, curated around the theme of a place of residence or habitation. To be commorant, means to occupy a space temporarily. In each of the seven photographers’ artworks, this theme is explored through the conduit of architecture. In the work of Odette England, Excavation No 9 (2015) presents a vintage family snapshot, upon which the artist has undertaken a meticulous and labor-intensive process of erasing with sandpaper. 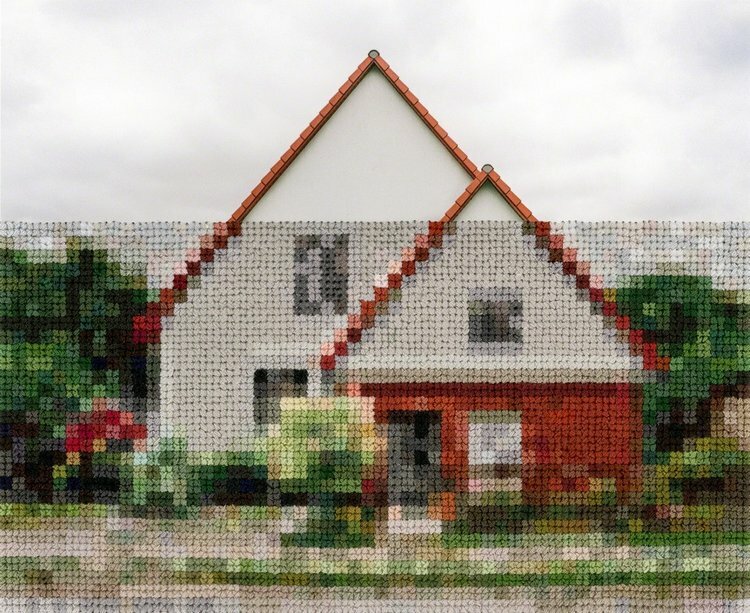 The image is obscured, leaving a trace of a building, reminiscent of the artist’s childhood home—now lost—that appears in her earlier work. There is a sense of loss, loss of memory, loss of home, and a nostalgic yearning for reclamation. Ben Marcin’s equally abstracted photograph, Brooklyn Museum, is a composite photograph made from individual photographs that focus on the physical infrastructure of the museum—hand rails, display cabinets, lights, seats, a/c ducts and so on. 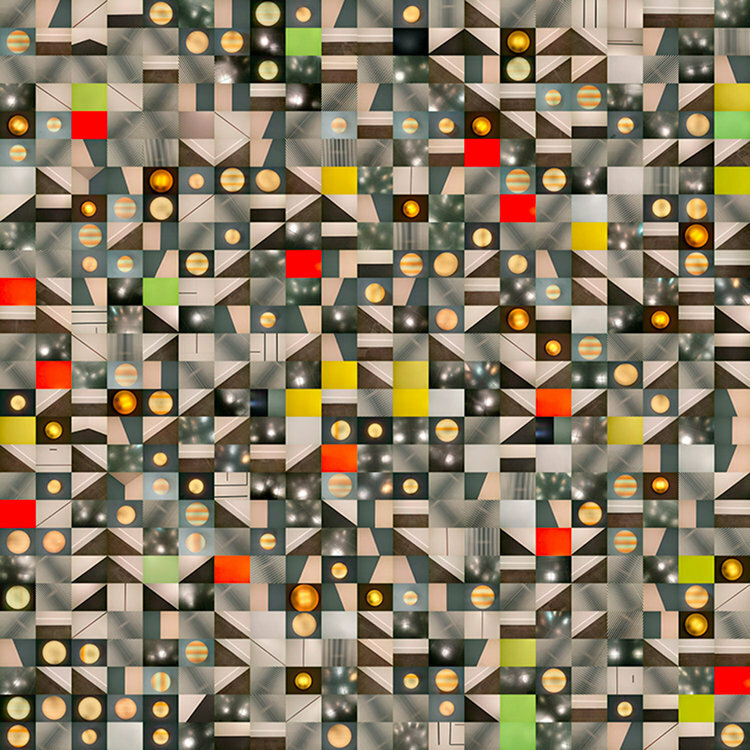 In this case, the idea of home and habitation relates to the artwork that resides within the institution’s collections. Artifact and architectural form is utilized to great effect by Joana P. Cardozo, in her creative and fresh approach to portraiture. The Blueprint photographs present everyday objects owned by her subjects, silhouetted against the backdrop of a floor plan of their place of residence. The silhouettes are metaphors not just for the person, but the suggested transience of identity. In Diane Meyer’s Berlin and Time That Might Otherwise Be Forgotten series, nostalgia and history of place and home is interrupted by the physical, environmental changes—such as the fall of the Berlin Wall—but also via the intervention of the artist’s hand through hand sewing the photographs. Boswijck, by Niv Rozenberg is a pleasing and colorful exploration of the Bushwick neighborhood of Brooklyn. His deconstruction of architectural facades and use of color blocking draws attention to the importance of how a neighborhood’s cultural identity is reflected within and by its built environment, which is ever changing as a result of migration and gentrification. In contrast, the Displacment series by Krista Svalbonas documents the temporary, re-purposed buildings utilized for the temporary accommodation of displaced migrants in post-war Europe. Each photograph is overlayed by another image of handwriting—personal letters from migrants to loved ones. Through the use of precision laser-cutting that traces the handwriting, both images become obscured. The artworks combine historical archival material (the letters) with the artist’s own documentation of the buildings (the photographs). As the title suggests, David Trautrimas’ Eidolon Point is a series of photographs that presents residential structures in such a state of decay that they almost become specters or ghost-like. The dilapidated buildings are additionally transformed in post-production, confusing inside from outside, combining structures to create phantom buildings. The works in Eidolon Point imagine architectural relics a miracle of a body with a soul, visualizing the place they inhabit when one leaves the other.